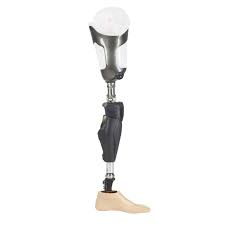 This is how a real prosthetic leg looks like. First time This time I tried biomed. I did the prosthetics module. The main idea of this module was to make a limb for someone that needs it, and it will make their life much better. This was my first biomed module I did, so I was a little scared about what we had to do, because it was something that I had never done. Making Our Prosthetic Leg Our first challenge was to go without a body part like a leg or a hand for 5 minutes. Then we had to write about our experience, and how it felt. For this part I decided to go 5 minutes without my leg. It made me realize that it’s really hard to do stuff without a leg, and it’s also very weird. Our second challenge was to actually make the prosthetic leg. We learned that the most important characteristics are strength, durability, longevity, shock absorption, lifelikeness and comfort. My group and I had a lot of ideas of what we wanted to make and it was difficult to decide. My experience At first I only wanted to do media tech modules but I was done with all of them so I had to chose between biomed or engineering. I wasn’t sure if our leg was actually going to work. I really liked this module because it made me be creative and look at things in a different perspective. I liked biomed but I think I know what pathway I’m going to choose.